My goodness this week has been hard. Thank you for all of your comments, tweets and emails, it really means a lot. I’ve been keeping incredibly busy, taking it one day at a time. Dad has been working like crazy too to keep his mind off of things. I guess we just have to keep on going, taking it day by day… maybe one day we can remember all the good things, but right now it feels too raw. Anyway, you’re here for food, so food you shall have! I have an admission; I’ve kind of been holding out on you. The crust for this recipe is my absolute go-to recipe for pie dough and I’ve used it for a good few years since developing it. Up until now, I’ve never planned a pie that needed a crust, or if I’ve used the crust, it’s been for other things, not for the blog. But, it’s high time I share it with you. 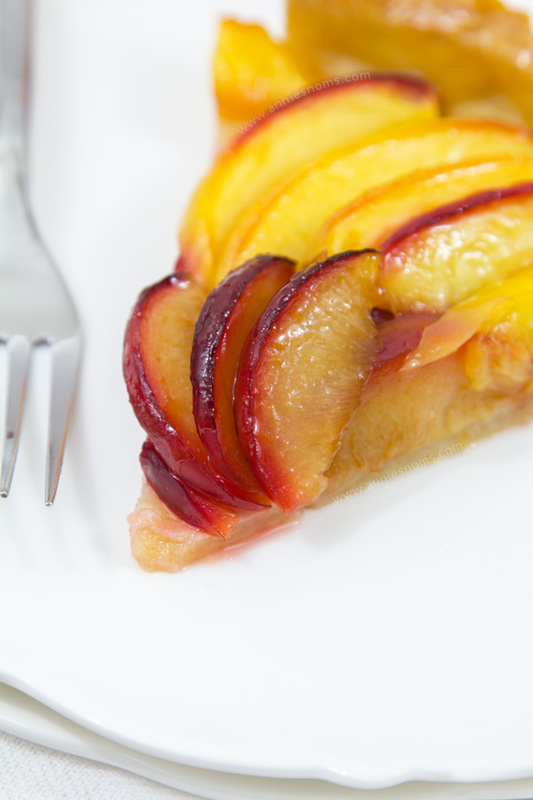 Especially as it’s married with juicy, plums and nectarines to create this scrumptious Plum and Nectarine Tart. 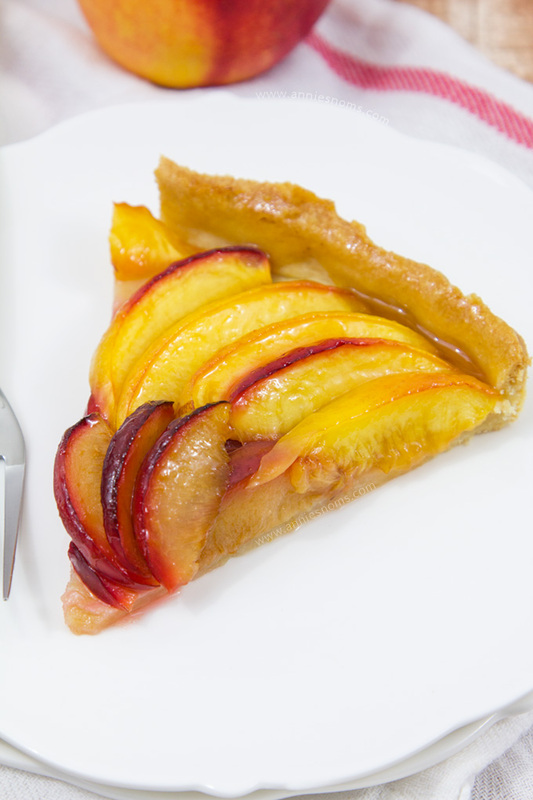 This tart required “proper” nectarines though, as the slices were longer and rounded enough to create the concentric pattern. Before we get onto the making of the tart, let’s talk about that pie crust… I have to admit with all the chaos of the weekend, I completely forgot step-by-step photos, so I’ve explained it as best I can. Next time I make this dough, I’ll shoot some photos and add them in! Have you ever used your food processor to make pie dough? If not, you seriously need to. Honestly, who has time to blend pastry by hand when you can do it in 30 seconds in the food processor!?? It’s the easiest thing ever and makes pastry even more approachable. It’s now the only way I make my pie dough. OK, you need 2 cups of flour, 3tbsp of sugar, 1/4tsp salt, 1 and 1/2 sticks cold, cubed butter and 3-4tbsp of water. For me it always ends up being 4tbsp of water. You start by pulsing the flour, sugar, salt and butter, just until it looks like coarse bread crumbs. Then you add in the water, 1tbsp at a time until it comes together into one large lump and doesn’t stick to the sides. Don’t be tempted to add more water until you’ve pulsed it for at least 20 seconds. It takes a bit of time to come together and you may inadvertently add more water than required if you add it in quickly. Basically, the whole lump of dough will whizz around the side as it doesn’t stick to anything and doesn’t have any more bits to mix together. This means it’s time to get rolling. I’ve found this crust very forgiving. It is a cinch to roll and turn and doesn’t crack/break or get holes in. To roll out the crust; I lightly flour the top of the dough, roll once, then turn it an 1/8th to the right, roll once, move it 1/8th to the right.. etc. etc. to keep the shape round. For this tart, I rolled my dough out to be just under 1/8th inch thick (3-4mm). Then you use the rolling pin to roll the dough up loosely, so you can carry it over to your prepared tin and unroll it over the top. TOP TIP: Break off a little piece of dough from the edge and roll it into a ball, then you can use this ball of dough to push the dough into the pan without cracks/finger marks. The secret to keeping that crust crunchy and not soggy with the fruit? Blind baking it before you add your fruit. I place a sheet of grease proof paper on top of the crust and tip in baking beans. Then I bake it for 10-12 minutes until the edges are just starting to colour. After removing the baking beans I put the crust back in the oven for 5 minutes to ensure that middle stays crunchy. After that, you can get to the fruit bit! Take your time making the pattern if you want maximum WOW factor! I think this tart has that…? Once you have your pattern, place back in the oven for 17-20 minutes, until the fruit looks soft and ever so slightly browned. It’s best to let the tart cool completely before doing anything else; I wanted to make sure this tart looked great in my photos, so adding that glaze was a necessity. 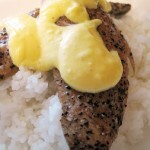 I used a couple of tablespoons of apricot baking glaze, mixed with a little water. Once mixed until you have a pretty runny mixture, I lightly brushed it all over the fruit and crust. Don’t you just think it adds to the final product? It looks so much more appetising! 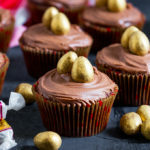 SO, a long post and there are loads of steps in the recipe, but don’t be scared! Follow all of these steps and you will end up with this amazing tart at the end. It’s crisp, sweet, juicy and perfect. Just gorgeous! 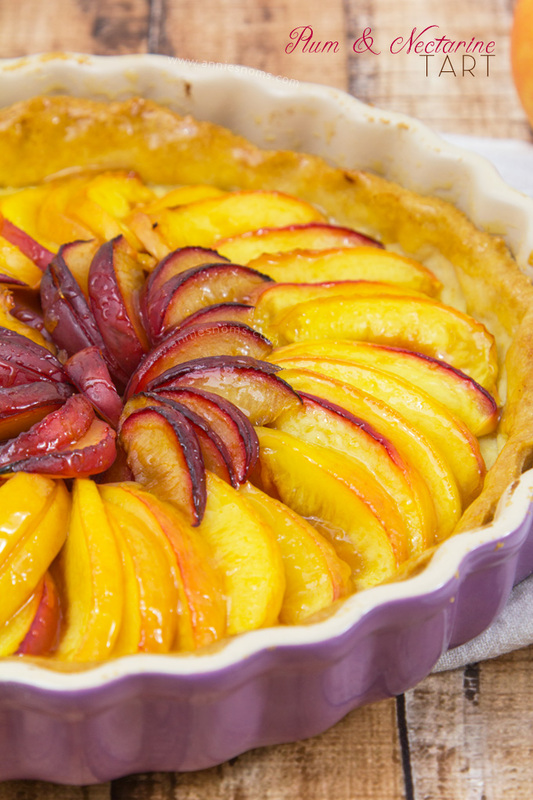 This Plum and Nectarine Tart may look fancy, but it's SO easy to make! Especially with my fool proof pie crust! 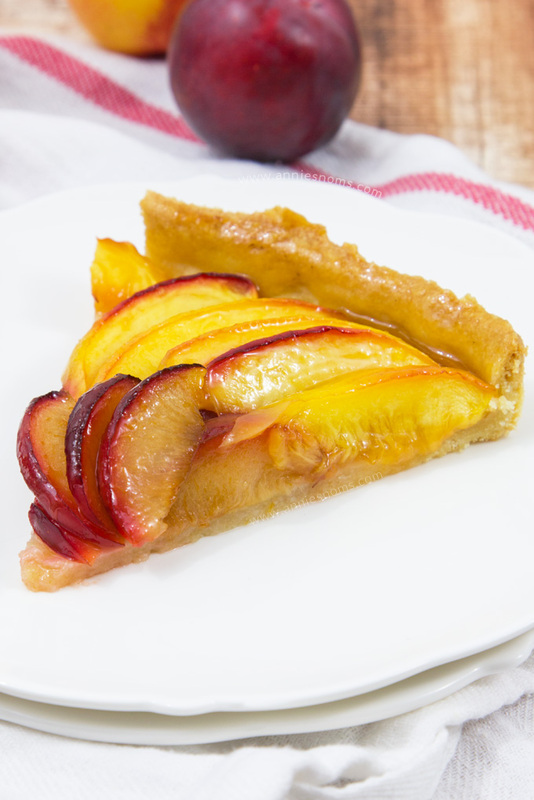 A crunchy base and soft, tender fruit that explodes with flavour, makes this tart a must bake this Autumn! Preheat the oven to 200C/400F and spray a 9 inch tart tin with cooking spray. 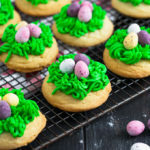 I use Wilton Bake Easy. Place the flour, sugar and salt into your food processor. Drop in cubes of cold butter around the whole bowl. Pulse for a few seconds at a time until you have a mixture that resembles coarse breadcrumbs. Add in water, 1tbsp at a time, pulsing in between for at least 20 seconds. (you pulse for longer because you may think you need more water, but in actual fact it will come together if you keep pulsing!). I normally need 4tbsp of water. Pulse until your dough comes together and doesn't stick to the sides of the bowl. 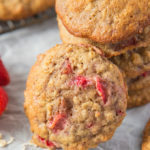 Alternatively you can place flour, sugar, salt and butter into a large bowl and use a pastry blender or your fingers to rub the butter and flour mix together until you have breadcrumb texture. Then add water 1tbsp at a time and mix with your hands until it comes together. I would advise the food processor method. Once your dough is ready, lightly flour a silicone pastry mat or your work surface. Tip the dough out and pat into a circle. (At this stage you can wrap the dough in cling film and place in the fridge to chill if required). Lightly flour the top and then roll once with a large rolling pin. Turn the dough 1/8th of a turn to the right and roll once, then turn it another 1/8th of a turn and roll. Continue until pastry is around 1/8th of an inch (3-4mm) thick, just over is fine. Re-flour the dough as required. Place rolling pin at one edge and then loosely fold the pastry dough up around the rolling pin. Take it over to your prepared tin and start unrolling it at least 3 inches further forward than your tin (in order to have enough to press it into the tin) Be gentle when un-rolling the dough. Let it fall into the tin. Remove a small piece of dough from one of the edges and roll into a ball. Lift and press the dough into the pan using the ball of dough to press it against the side and create a smooth, flat surface. Use your rolling pin to roll over the top of the pie tin gently, to cut away the excess pie dough (see note). 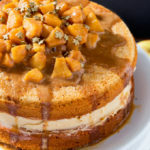 (Dough will shrink in the pan, but this is what you want with this recipe as otherwise it will be too tall for the filling). Take a fork and prick holes in the bottom of your crust. Place a sheet of grease proof paper in the tin, ensuring it's big enough to come up the sides of the crust too. Tip in baking beans and make sure they cover the bottom of the crust. Place in the oven for 10-12 minutes, until the crust is just starting to colour. Remove baking beans (I tip them into a bowl to cool) and then place the pie crust back in the oven for 5 minutes. After 5 minutes, remove from the oven and leave to cool for 2-3 minutes. Then start with your filling! I started with plums in the centre; Find the centre of your pie and then move outwards slightly. Place slices of plum, overlapping each other in a clockwise circle. 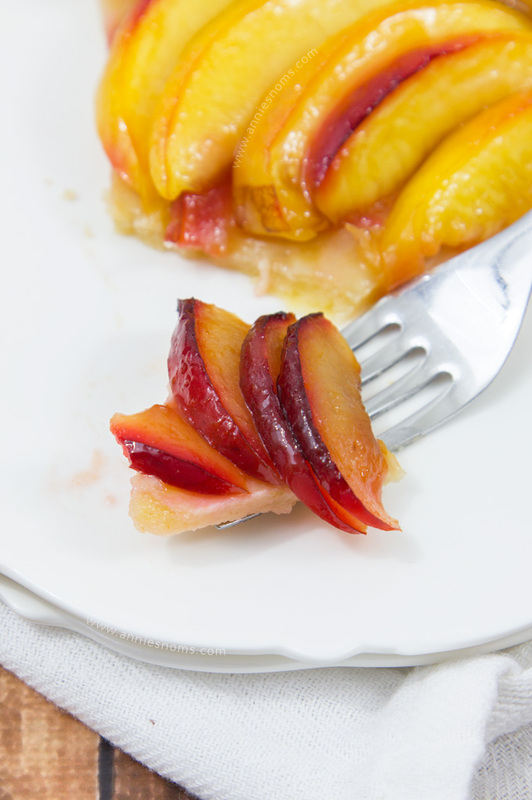 You can either go the same way or opposite way with the slices of nectarine, but follow the same process, overlap each slice and turn slightly so the slices will go all around the pie and meet each other. Place in the oven for 17-20 minutes until the fruit looks soft and ever so slightly browned. Crust will be golden. I always use a pie crust shield around the edges of my pies to make sure the edges don't get too brown. If you don't have one, roll up some foil and then shape it around the tin to cover the edges. Leave pie to cool completely before adding glaze. Place apricot glaze into a small bowl and ad in water. Mix until well combined and smooth. you want a fairly runny mixture. 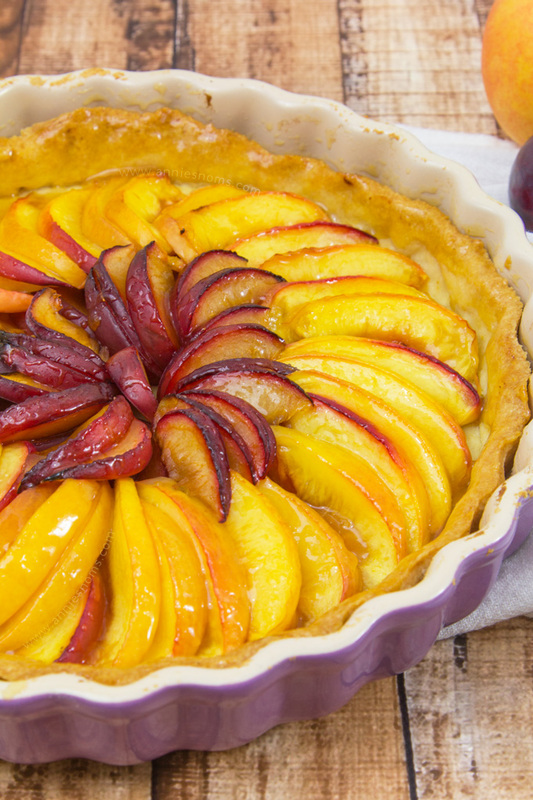 Brush the mixture all over the fruit and crust to create that glossy finish. DEVOUR! Tart will keep covered, in the fridge, for 3 days. This tart looks amazing, Annie! Absolutely delicious! Well done! The tart looks fantastic. 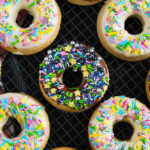 I’m going to try the glaze the next time I make one. I usually skip it, but it really added a nice glow. This is so great. 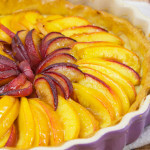 I would love you to stop by Food on Friday: Pies & Tarts over at Carole’s Chatter to add this to the recipe collection! Cheers! This tart is perfection! Sorry you’re going through a rough time 🙁 I hope things look up soon!!! This is beautiful! I love all your tips too – very helpful! Sorry to hear about the rough patch – hope things get better soon! Beautiful tart! I can’t get enough of nectarines. I love to eat as many as I can during the season. The plums also add beautiful color and unique flavor. I wish I had a slice for dessert! Thanks so much Ashley! I’m a little obsessed with nectarines too at the moment, so delicious! This is beautiful! I’ve only ever eaten plums and nectarines as fresh fruit. Our landlords gave us a bunch of plums . . . and then later, nectarines. If they are as generous next season, I will definitely know how to use the fruit up! In the meantime, looks like I need to run to the store before the season is over! 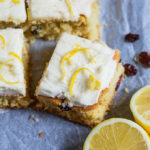 Thanks so much for this delicious recipe! As soon as I saw this I though “too hard, looks way too good”! But then I read your post and the recipe …. and YES, I can DO THIS! 🙂 So pretty! Yum! That fruit looks amazing! Lovely! I am visiting from Whats It Wednesday. Plums are nature’s candy. This dish is so beautiful! What a stunning tart, Annie! Your hubby did a great job on arranging the fruit all pretty and your crust is beyond GORGEOUS! Wow, what a gorgeous tart! I recently had a similar one at a restaurant and it had almond flavoring in it, which was soooo good! I bet you could add a little into the crust for a little extra! This is such a pretty dessert. My friend makes apricot jam, I going to have to get a jar from here to make this. Pinning for later!